Located in a residential area of Blanes, Cala Sant Francesc, Costa Brava, Girona at only 400 meters to the beach. It's surrounded by a 1500 m2 of private garden. It has a porch of 45 m2 with amazing views over the sea (Cala Sant Francesc) and on the mountain (Castle de Sant Joan). The place is paradisiac, the views from the house are incredibly nice and as the villa is located between two botanical gardens, Mar y Murtra and Pinya Rosa, it enjoys a unique micro-clima, so that it keeps a constant and pleasant temperature all along the year. It is a one floor house, so all the rooms are spacious and confortables. There are three bedrooms, one with a two person bed and two bedrooms have two singles. 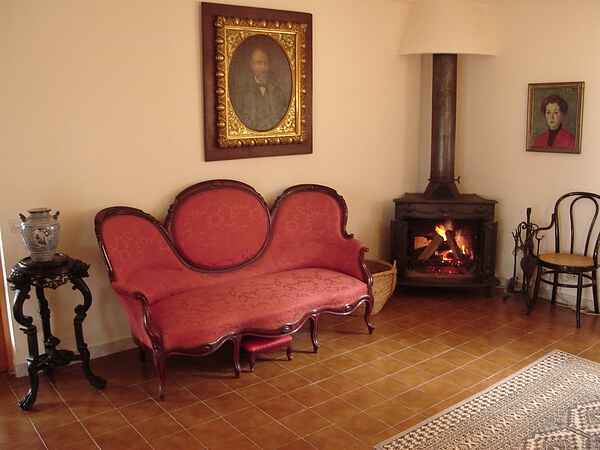 The living with fireplace is spacious and there is also separate large dining room with fireplace. A kitchen with washing machine and dishwasher. You can also find two complete bathrooms, one of them with bidet. On the porch of 35 m2 you can sit in the shade during summer and enjoy the sea view and of course is the garden of 1400 m2, perfect the children to play. Garage for two cars. 150 meters from the villa there is a private comunitarian area with 25m x 12 m swimming pool, two tennis courts and a cafeteria.